Those four fresh faced youngsters above are Model Aeroplanes and with nary a hipster beard nor a tattoo in sight are just about the hottest, hippest most happening name to drop right now. 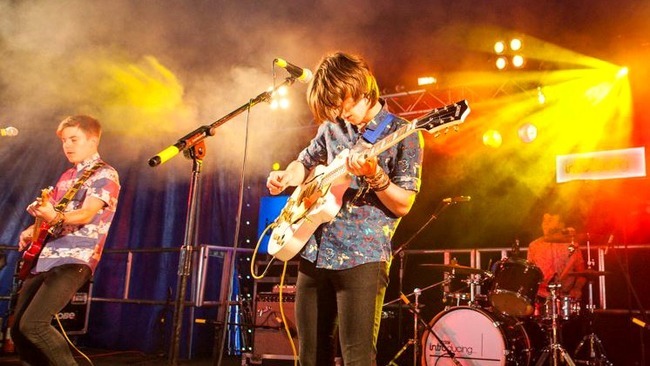 Crowd pleasers at this year’s Liverpool Sound City and both the T In The Park and Wickerman festivals, not to mention the up-coming Belladrum festival, there’s a huge, expectant buzz around the Dundonian four piece. 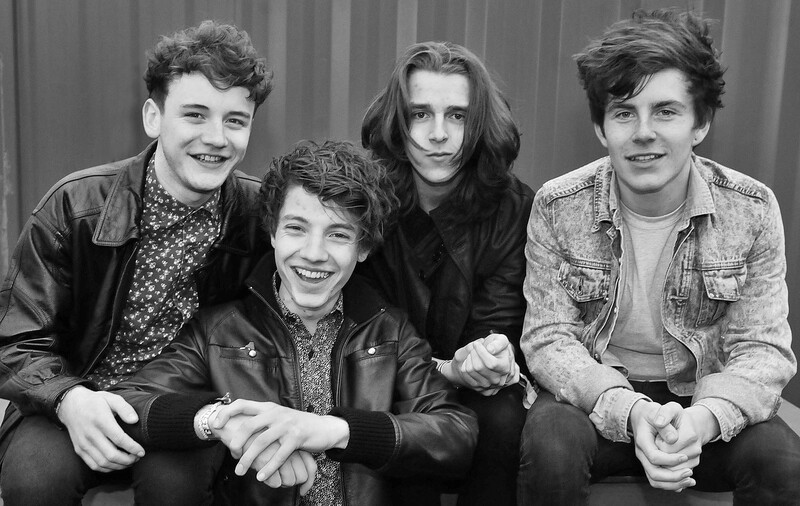 If I was 18 and sick fed up of Arctic Monkeys’ gradual drift away from their early sound, Model Aeroplanes would be my new favourite band. Featuring the classic bass, drums and two guitars set-up, they play well-crafted, infectious songs that rattle and roll in equal parts. Younger readers might also hear them as an updated version of a less reliant on effects pedals Foals or Vampire Weekend, with the twin guitar attack firing off chiming African-influenced chattering riffs. Cynical old gits like me who’ve been around the block more than once (and bought the original t-shirt, not the updated Primark version) are harder to impress. You could play spot-the-influence all day if you like, but there’s no denying Model Aeroplanes are a bright ‘n breezy breath of fresh air. You know those folk that put half a dozen Mentos into a bottle of Coke then film it for You Tube’s sake? That’s the sound of Model Aeroplanes. Put some elements of the less-precious end of post-punk in the bottle. Add equal parts Talking Heads when they discovered Africa with the expansive skittering widescreen sound of Franz Ferdinand. Dilute the mixture with the pop nous of Haircut 100, who took the Orange Juice blueprint and, with a spit and a polish, galloped with it into the charts. Shake the whole thing up and let it explode. Voila! 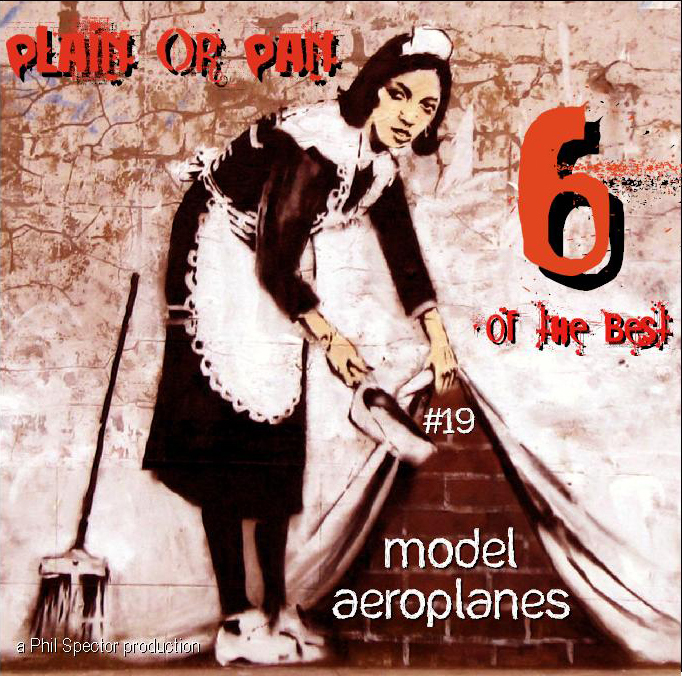 Model Aeroplanes! If you’ve pressed ‘play’ above, you’ll know that their whole sound, whilst rooted in the DNA of ‘proper’ indie is as polished as the shine on their smiling wee faces. Underneath the two guitars is a terrific rhythm section, all counter rhythms with tons of cowbell and pitter-pattering percussives. They’re far too young to remember that old “there’s always been a dance element to our music” cliche, but Model Aeroplanes could say that honestly and proudly with hand on heart. By the time they get around to releasing an album they’ll be gunning for the charts. They have proper hit-making potential and Radio 1, in particular Edith Bowman and Vic Galloway love them. The band have built up a rabid fan base who travel to the gigs the way football supporters follow their team the length and breadth of the country and they’ve helped recent release Electricity clock up over 30,000 hits on You Tube. We became massive Twin Atlantic fans around the time of Vivarium and are to this day. This just reminds us of being 14 and drinking White Storm Cider at our local park. This is one of the most well known songs in existence but even if you didn’t know who it was when you were young, if you recognised it, I’ll bet you went mental at the bass solo. Most people, if they listen to our music, would be shocked at bands that have influenced our playing in the past. The Fall of Troy were among bands like The Mars Volta, Meet Me In St. Louis, Biffy and Twin who’s songs we’d learn then mosh out to at practice back in 2010. Anything with a weird time signature was acceptable but ‘F.C.P.R.E.M.I.X’ is in 4/4 and still rocks. We still give it a bash at most practices now so I suppose it’s a sign that playing pop music hasn’t completely taken us over. Last August we were given an amazing opportunity to support Editors at the HMV Picture House in Edinburgh. At the time it was the most people we’d ever played to at once, around 1,000 when we went on, but we’ll always remember how nervous we were walking on stage. I could have spewed, we hadn’t really felt nerves like that before and haven’t since to be honest. It’s good to remember. This song is an anthem. One of our older friends showed us this song in 2009, we were blown away. Kieran learned how to play dance-beats and the rest is history. (Rory) – I saw Miike Snow on Later with Jools Holland in about 2009-2010 and, for the most part, have listened to them every day since. No joke. Model Aeroplanes are often out and about on the road. In the Autumn they had out as support to Fatherson. Before that, on September 12th they make a *flying visit to Irvine to play the intimate environs of the town’s Harbour Arts Centre. A great place to see them before they make their inevitable climb up the ladder and into the larger venues, tickets are only a fiver. You can get them direct from the HAC 01294 274059 with no booking fee, or via http://www.ticketweb.com, with a small booking fee added. I’ll be there. You should do your best to get alongl too. *I couldn’t go the whole article and not make some sort of aviation-based pun. Sorry Craig, had to buy the Primark versions. The old originals don’t fit no more. Another top drawer posting Craig. Never heard them before but like what I hear. As you say you could play spot the influence all day but makes no odds if they sound this good. Cheers for the introduction to them..